In addition to Española and Fernandina, Genovesa (also known as Tower island) is one of the absolute top visitor sites in the archipelago. A bird sanctuary par excellence; this is the absolute best place to see the red-footed booby. Located in the far northeast you can only visit this island by cruise expedition. When your vessel arrives at Genovesa, make sure to stand outside on deck to have the best view; the navigation here is spectacular. You sail into the caldera of the volcano, after which the island embraces the ship like a circle. Genovesa has two special visitor sites: El Barranco and Bahía Darwin. It is also an excellent location for snorkelling and to enjoy beautiful panga rides along the coastline. Through a panga ride, kayaking and snorkelling activities you will discover marine life as well as animals and birds along the caldera. Along the rocky walls you can also find the rare Galápagos fur seal. The water of the caldera is teeming with marine life. Whilst snorkelling you will see many beautiful tropical fish and you have a good chance of spotting a hammerhead shark. After a dry landing you will climb up the wooden stairs along the rocky cliff. Arriving at the top a noisy welcoming committee of nazca boobies awaits. They are quite curious and love to be photographed. 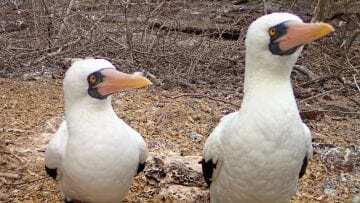 You continue along the path across the island, surrounded by palo santo trees where you observe large numbers of breeding colonies of the great frigate bird, nazca boobies and red-footed boobies. The cliffs along the south shore, formed by lava, are an ideal nesting place for storm petrels. These particular petrels, endemic to Galápagos, have a special habit of being active during the day as opposed to its peers who normally feed at night. The path ends at a vast lava field, the habitat of the short-eared lava owl. These owls hide well in the landscape, but with some luck and a good eye you may see how he hunts and stalks his prey, the storm petrel. You can reach Darwin Bay by a wet landing on a small sandy and coral beach. You will find an abundance of birds in this bay. You will see swallowtail and lava gulls, mocking birds, the yellow warbler and the endemic Galápagos heron and Galápagos dove. The red-footed booby nests in the trees, their red feet stand out beautifully against the green-leaved bushes. A path leads from the beach along tidal pools and lava ledges to a high point overlooking the bay. From this point you have one of the most rewarding views in the Galápagos. Do you want to visit Genovesa and other islands? We will make your dreams come true!